Do you want to be in a Disney Video? You have a chance because they are holding auditions for Disney KH II.5. 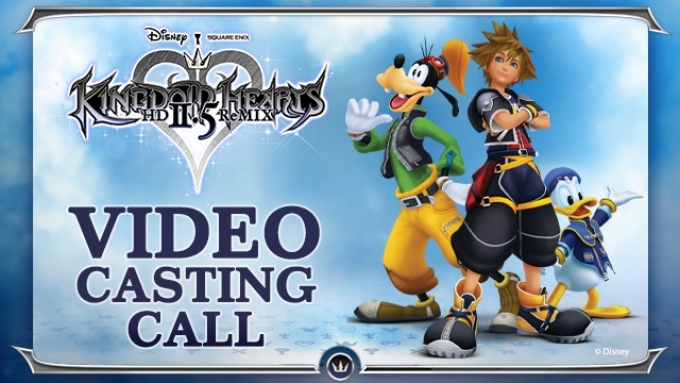 Attention Kingdom of Hearts fans, Square Enix and Disney are holding a casting call for a video to be produced for the new Kingdom of Hearts release. The video will be lots of different people doing different things and will be filmed in the Los Angeles area later this week. Disney is casting fans to be a part of the video and are holding an online casting call for those that are interested and available in the Los Angeles area. What you’ll be doing is a surprise and the full details of what the video will consist of have not been released. If you want to be in the Official Kingdom of Hearts video and maybe even pose with the Kingdom Key… read on. Square Enix and Disney would like to hear from the biggest fans. To apply you need to send an email to the casting directors and producers explaining why they should pick you to be in the video. The Disney Kingdom of Hearts commercial will be filming on the 6th between 10AM and 7PM. The location it will be filmed at is a huge surprise and not being disclosed to the general public, only those cast in the video will get to know what the location is so they can attend. Filming should take about 2 hours and you must be available for the entire day because different people will be given different time slots if they make the auditions. You can be any age to audition, but if chosen and you are under 18 you will need to come with a parent or legal guardian. The video auditions are on… Check it out! Want to be a part of an official KINGDOM HEARTS collaboration video? Simply tell us why you LOVE the KINGDOM HEARTS franchise and you may be selected to be part of a filming in the Greater Los Angeles area on September 6th, 2014 between 10 am to 7pm PDT with the official Kingdom Key! To ensure that you’ll be able to qualify for this event, please make sure that you will be available in the Greater Los Angeles are on September 6th at a surprise location between the hours of 10pm and 7pm. Your portion will take no longer than 2 hours. Send us an email to NA.KingdomHeartsfans@square-enix.com with the below criteria. Are you excited for KH2.5? What would you like to say to the KH2.5 dev team? What do you most look forward to for KH 2.5? Why/when did you start playing KH? What does KH mean to you? Who’s your favorite KH character? What is your favorite KH moment? Do you have a favorite KH song? And/ Or What’s your favorite KH game and why? If you get selected, which slot would you want to be in? You can choose from the day slot (10am-2pm) or evening slot (3pm-7pm). Once your email has been sent, our KINGDOM HEARTS team will review every entry and notify you if you have been selected for one of the extremely limited slots! Make sure you tell your friends and you can be filmed together! *Please note if you are under the age of 18, a legal parent or guardian presence will be required or we will ask for you to sign an event waiver to be brought in on the day of the shoot. Hi my name is Angela Bakker. I am from Bulgaria and Holland. I can speak perfect English. I am 10 years old. I do gymnastics every day for 3 hours and I am pretty flexible. I have always wanted to be an actress since I was small. Me and my friend always play this game where she gives me an impression and I have to do it and then it’s her turn, and then she gives me a score from 1-10 and she tells me what I did wrong if I did something wrong. We play the same but with singing and we get to pick our songs. And I am pretty good at acting because I once made my brother think I was crying. I have had some experience with acting, in grade one and two I have done drama class and I will also do it in 6th grade if I can because I love acting and singing. And just by watching disney channel just inspirers me more and more every time. And just by watching a movie from disney channel just make me think wow this actor is so amazing and that makes me think one day I could also be like that. And that is just what makes me happy. And mostly when me and my friend sing and act I always get a 8 or 9 and sometimes even 10. I would really love to get the part. My cousins and I would go to this swimming pool and there they would have a stage and my cousins and I would make a scene and then we would show it to our moms and they would clap at the end and I would just fell wonderful but now my cousins are way to lazy to do that and I just want to have that feeling again. I would really like to be in this video because one day I want to be a singer like five seconds of sumner. So I really hope you choose me. My name is Maria Adesanya and I am 12 years old. I am from London but live I Chesterfield. I am a very well passionate, talented actress and singer. I have a little experience from when I auditioned in Kings Cross for celebrity talent academy. I would really love for you to give me a chance because I don’t want to give up on my dreams. I am normally shy and wouldn’t step up to do stuff like this but I am going to be brave. I promise I will make you proud.